Language is acquired with the knowledge of linguistics and phonetics. Linguistics helps the individual to give an answer to any language question that has been asked by a student, lay man or any other educated person. Phonetics is also useful to make out what the other person is speaking. Many students who do their post-graduation in English do not take Phonetics seriously and fumble when they have to teach at any level. 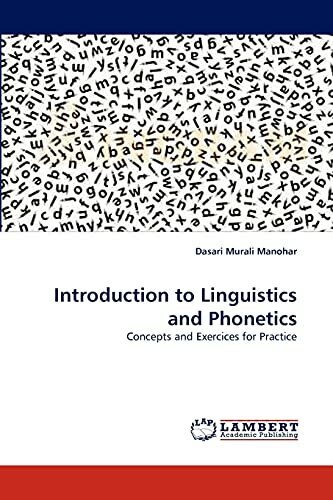 This book provides basic concepts on Linguistics and Phonetics and a few exercises to practice. The intention of the book is to reach out to the learners of different levels. However, the references given at the end of the book will help the reader to research further in the areas of Linguistics and Phonetics. Dr.D.Murali Manohar, MA, B.Ed, M.Phil., Ph.D, Associate Professor of English, Department of English, University of Hyderabad, Hyderabad. His research interests are British, Indian (Dalit) Literatures and Language Studies. He has ten books to his credit and several articles published in national and international books and journals.